Today on the DJzone Bench, we have the Blizzard Puck 3 Unplugged. This is mostly the same LED fixture as the Blizzard Puck3nx, but with the ability of being used wirelessly via its built in rechargeable Li Ion battery. The case of the Puck3 is made of a heavy gauge steel. It feels solid when you pick it up. Out of the ten or so we have on our bench, none of them rattle when you shake them. This means they are made extremely well and to exacting standards that prevent the internal components from coming loose and causing failure during transport. Since LED lights have gone mainstream, corners get cut as manufacturers try to put the products out at a pricepoint that is affordable to buyers. In doing so, we have found that some manufacturers do a “clump” Led configuration instead of a single LED. This means they take a red, green and blue LED and clump them together and then place a lens on top of them. This “clump” gives you all the RGB colors with one drawback. When you try to mix colors like the most popular color DJs use, amber, you get what is called haloing. Instead of the color mixing inside a single LED, it mixes about a foot or so past the lens over the LED clump. When using them as an uplight, you will see a funky colored halo projected onto the wall. Some find this haloing unacceptable. The thing that thrilled us about the Puck 3 Unplugged was the single LED configuration. The gamuts of colors are mixed inside the LED, then they go through the lens and then out of the light, hence, no haloing and odd looking colors floating around the light. The light is fitted with a dual yoke that allows versatility and options for placement on the ground and hung from trussing. On the back there are the traditional buttons to change the light’s settings, the AC connector, on/off switch and a second switch that will allow you to use the wiCICLE wireless DMX dongle that Blizzard has available. Also there are XLR connectors for DMX daisychaining. 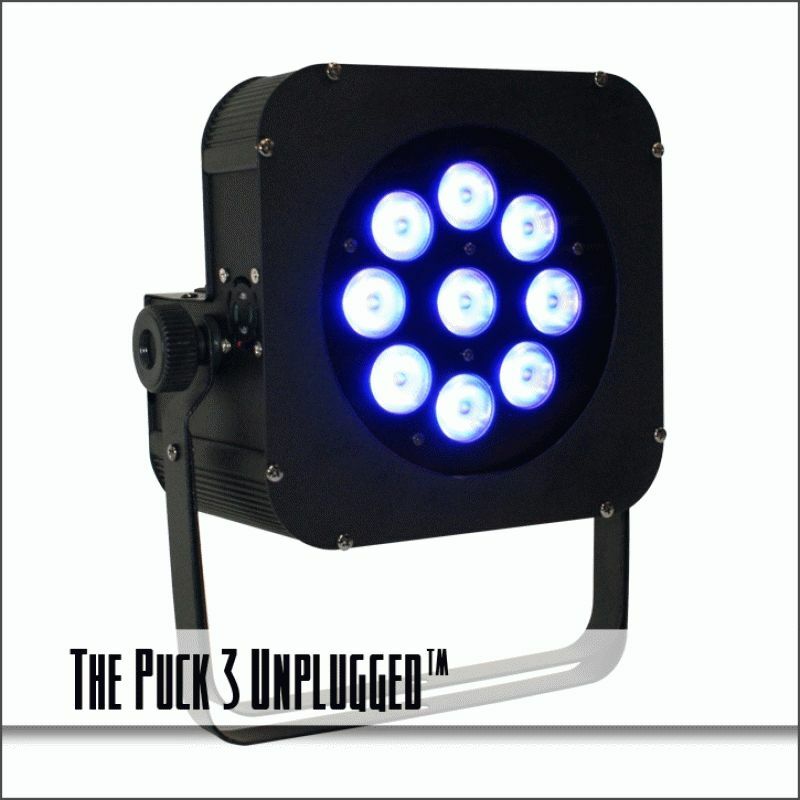 The Puck3 Unplugged have nine 3-watt RGB LEDs each enhanced by a lens and protected by a clear polycarbonate cover. There were no worries about finding AC power when we arrived at our venues. For the first one, we used a set and forget setting, thus choosing the color mix ahead of time so we could just walk in and drop them wherever we wanted them. The second event we decided to use the wiCICLE DMX feature and daisychain the “slave” units via DMX cabling. This was almost as convenient, but it made us want to have wiCICLE dongles for all the units. We used these for a couple of weddings and were impressed with the color mixing we could do with them. If we wanted Amber we could get Amber. Most any color that we wanted we could mix with these lights without any haloing or weirdness being projected on the walls. They gave us clean rich color from the light to the 14’ ceiling. We found when we used the Puck3 Unplugged with a single color (AKA Red, Blue Green), we could get about 8 hours of battery life from them. When we went with a mixed color (AKA Amber, Teal, Orange), we got about 6 hours. We found we could dim the mixed color and squeeze about 7.5 hours out of them and no one noticed the difference in the quality of light.